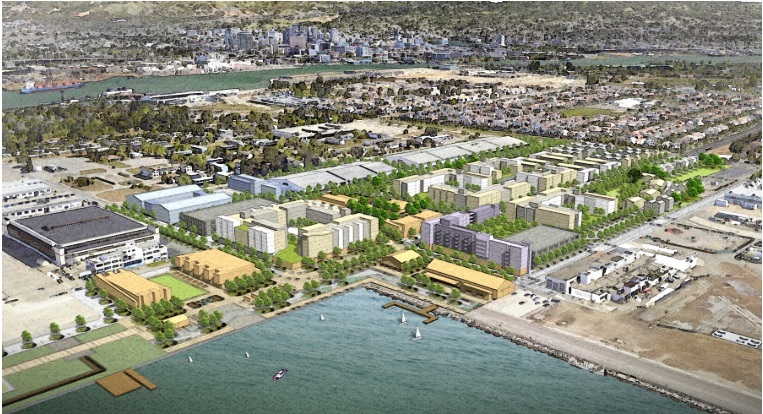 ALAMEDA, Calif. – (RealEstateRama) — The City of Alameda and its private partner, Alameda Point Partners, LLC, on May 23rd celebrated the groundbreaking of the first phase of the $1 billion mixed-use, transit-oriented waterfront development at the gateway to Alameda Point, called Site A. The 68-acre Site A development is located on the site of the former Naval Air Station Alameda, which closed over 20 years ago. Alameda Point Partners (APP) is a joint venture led by Managing Partner Trammell Crow Residential (TCR), a division of Dallas-based Crow Holdings, and also includes commercial developer srmERNST Development Partners, affordable non-profit housing developer Eden Housing, retail landlord Madison Marquette, and financial partner Cypress Equity Investments. Projected to cost $500 million, the first phase of the Site A project consists of 673 housing units, including 130 units of affordable housing for low and very-low income households, and an additional 310 units affordable to middle-income households, eight acres of parks and open space, and nearly 100,000 square feet of resident-serving retail, dining, and maker spaces, as well as space for community events and gatherings. Major infrastructure improvements on the 30-acre phase one project include new water, sewer, electrical and gas lines, newly paved streets with bike and transit lanes, and bulkhead improvements on Seaplane Lagoon for the new ferry terminal. Eden Housing will develop a total of 130 affordable housing units in phase one on Block 8, a two-acre parcel at the corner of Ralph Appezzato Memorial Parkway and Orion Street. Eden Housing’s homes will be targeted at extremely low, very-low, low, and moderate-income households, which will be constructed in two buildings. One will be a “family” building with 70 units, while the second will be a building for seniors with 60 units. KTGY Architecture + Planning is the designer of both buildings. “Eden Housing is grateful to be selected by the City of Alameda and Alameda Point Partners to develop the low- and very low-income housing component of Site A,” said Eden Housing President Linda Mandolini. “We are committed to building high-quality housing that is affordable, sustainable and transit-oriented.” Residents will have convenient access to a variety of urban amenities including bus rapid transit, the future ferry terminal, parks, a secondary school, grocery store, and pharmacy, according to Mandolini. Upon buildout, the 68-acre master plan development will bring 800 residential units and up to 600,000 square feet of commercial space, 15 acres of parks and public open space, and new transportation services and facilities, including the new ferry terminal. Site A is attracting a new generation of people who are looking for a less car-dependent lifestyle. According to Hill, a goal at Site A is to reduce dependency on the automobile and improve alternative modes of transportation by encouraging people to shift a greater share of their trips to public transit, biking, and walking. “Having the new ferry service located at the front door of Site A is a game-changer! Alamedans can get to San Francisco in 20 minutes stress-free by boat,” Hill added. Alameda Point Partners is scheduled to move forward with the transfer of approximately 20 acres from the City in 2019 for the project’s second phase. The timing of the third phase, which is slated to include a hotel plus additional commercial space, will be a function of the Navy’s completion of its remediation activities before the remaining portion of Site A is turned over to APP. Completion of the new infrastructure for phase one of Site A is expected within the next two years, with vertical construction of the new buildings commencing by year end. The first residential units are projected to be completed in the second half of 2019. The project will create approximately 2,500 direct construction jobs over the life of the project and serve as the catalyst for thousands of future jobs. At the groundbreaking ceremony, the following spoke: Trish Herrera Spencer, City of Alameda Mayor; Malia Vella, City of Alameda Vice Mayor; Marilyn Ezzy Ashcraft, Alameda Councilmember; Frank Matarrese, Alameda Councilmember; Jim Oddie, Alameda Councilmember; Bruce Dorfman, Senior Managing Director, Trammell Crow Residential and Managing Partner, Alameda Point Partners; Jennifer Ott, Director of Base Reuse and Transportation for the City of Alameda; and Linda Mandolini, President, Eden Housing. In Block 9, Cypress Equity Investors, one of the buyers of land from APP, is proposing to build 200 residential units that offer “affordability-by-design” to be appealing to moderate-income households. The new development would include approximately 10,000 square feet of retail/commercial space. The project’s designer is PYATOK. On Block 11, TCR will be developing a 220-unit market rate apartment community that will be highly amenitized with larger units offering views of the City and the Bay. According to Hill, “The Alexan Pan Am site is truly one of the best in the Bay Area – with its views, proximity to the new ferry, and central location in this new community, Alexan will be one of the most desirable rental properties in the East Bay, a draw to local residents who are presently living in older properties but are looking for a newer and higher quality housing option. This will help to reduce rent pressure for older apartments.” The Alexan Pan Am will include 15,000 square feet of neighborhood-serving retail and commercial space and is expected to break ground in late 2018. BAR Architects is the project’s designer. In Block 6, Trumark Homes plans to build 63 townhomes, according to Hill. KTGY Architecture + Planning is the project’s designer. Block 7 is currently optioned by Trumark Homes for 60 townhomes. The concept design architect was Kwan Henmi Architecture/Planning, which is now DLR Group|Kwan Henmi. KTGY Architecture + Planning is the executive architect.